As promised, we now have the report of the Economic Statistics Review Group – the high powered committee set up in the wake of last summer’s “Leprechaun Economics” affair. You remember that one – when revised annual GDP data showed the Irish economy had grown by 26% in 2015, prompting Prof Paul Krugman’s famous (and rather cruel) remark. Still, look on the bright side – Leprechaun Economics is now a useful shorthand for a genuine problem: how to compile national accounts data in the age of multinational companies, global supply chains, super-valuable intellectual property, and advanced (or aggressive) global tax planning. There is a general issue for all countries that host multinationals, but it is particularly acute for small, very open, highly globalised economies, like Ireland, and probably Luxembourg, Singapore, Hong Kong and a couple of others, where the impact of very big companies on very small national accounts is greatest. This has been a conceptual problem discussed in the rarefied atmosphere of international gatherings of National Statistical Agency heads – until last year, when it burst out into the real world with the full application of the ESA 2010 national accounting standard in Ireland. As other countries roll out ESA2010 fully, more are expected to find anomalies in their own numbers – but few are expected to be as spectacular as Ireland’s, primarily because of the outsized footprint the global multinationals have here. 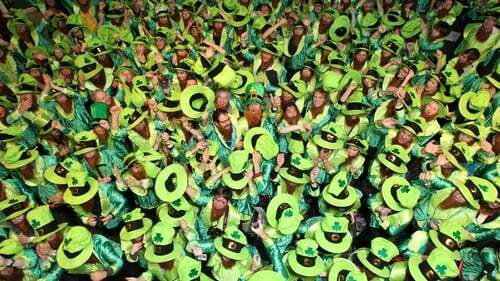 In the meantime Ireland faces some real practical problems because of the Leprechauns in the numbers. The problem is that GDP is no longer a viable guide to the true health of the domestic Irish economy – but it is the internationally accepted and mandated figure for assessing most macroeconomic data by. The Review Group, which was chaired by Central Bank Governor Philip Lane, offered 13 recommendations across five main themes to produce some additional indicators to help make better sense of what’s really going on in the Irish economy. GDP, GNP and GNI will still be produced according to the international rules, but the new indicators will roll out alongside them over the next few years. The key indicator for production this year is GNI Star (written as GNI*), which is a modified version of Gross National Income. and 2. Depreciation on foreign-owned capital assets located in Ireland, such as intellectual property (which inflate the size of Irish GDP, but again the benefits accrue to foreign investors). The report stresses the real activity reasons behind that 26% surge in 2015 GDP. “The level shift in GDP of 26% in 2015 was largely a consequence of the relocations of entire balance sheets to Ireland from outside the EU and the activity related to these relocations. The relocated companies are FDI enterprises which already had affiliates operating in Ireland”. Net National Product already strips Depreciation out of the GNP number, and the difference is quite large, as this chart shows. It also shows the big level change in GNP in 2015. The CSO added to this in their presentation yesterday, with information from their “Large Cases” Unit, which deals with the 50 biggest foreign owned multinationals operating in Ireland. They account for about 80% of corporate turnover in Ireland, almost 70% of goods exports, over 80% of services exports and 90% of services imports – a key figure. Governor Lane explained that the review group was looking for an indicator that was “robust to the accounting decisions” of multinational companies operating in Ireland. Another key aim was to have an indicator with minimal adjustments to an existing, widely understood standard international measure. GNI Star fits that bill, as it takes GNI and modifies it for foreign owned depreciation and retained earnings. Some Irish economists try to make these kind of adjustments, but it is better if the CSO does it (it’s a timesaver, at the very least). GNI Star has various uses. For the Government and political system it should provide a better indicator to measure the national accounts against – particularly the debt ratio. For the Central Bank it provides a better indicator for assessing the Countercyclical Capital Buffer – the tool the Central Bank has to stop credit bubbles. But it depends on a clear insight into the true nature of growth in the economy, so measures to take out the multinational effects out of the picture should help. The CSO haven’t yet done the numbers to produce GNI star in a full set of accounts, but they did produce a “proxy” version for illustration, taking the GNI figure for 2015 and then subtracting depreciation for the fifty largest Foreign-owned Multinationals in the Large Cases Unit. The differences were quite stark in 2015, as the chart shows. The solid black line, indicating proxy-GNI Star, is also notably more stable than the GDP line. But if Ireland has its own economic indicator that it uses to better manage its own economy, won't this cause problems with the Fiscal Compact and other binding rules that are anchored with GNP? No, according to Governor Lane – a one-off education effort will persuade the key audiences for this indicator of its merits. The CSO is still pretty sore about the ribbing they got last year over Leprechaun Economics. The agency’s boss, Padraig Dalton, said the Irish economic commentators got to grips with the problems exposed by last July’s bombshell very quickly. His explanation – the expertise on accounting for globalisation lies in Ireland, because its effects are felt most acutely here, one of the most highly globalised economies on the planet. People in other countries understand globalisation well, but not its impact on national accounting systems. Irish statisticians have learnt something valuable for the international statistics community. Now they should shamelessly exploit the term “Leprechaun Economics” as a marketing tool for that expertise.